Those who treated themselves to Maria Darnoult’s debut novel, Face The Music, will be delighted to know that the sequel, Crescendo, is now available. Maria’s latest book continues to follow the love story of William Waverley and Hannah Corlett which scandalised the inhabitants of Castletown at the turn of the twentieth century. William, an aging widower, headmaster, church organist, choir master and pillar of local society, raised more than a few eyebrows in the ancient capital when he fell under the spell of a shop girl almost thirty years his junior. Crescendo tracks the exploits of the loved-up couple as they embark on married life, with Hannah coming to terms with her changing circumstances and step up from her previous role as a working girl. But inevitably the resistance of the townsfolk in Castletown continues to colour their lives and it isn’t long before the newly married couple find a skeleton in their own cupboard. You’ll also be introduced to a new set of characters who weave in and out of the story, providing several sub plots and a whole range of additional thoughts on the lives of those in changing times. 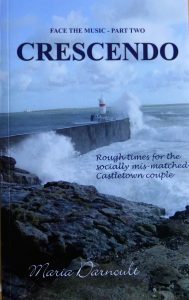 Although a fictionalised account, the main characters within Crescendo are based on the lives of the author’s grandparents, with a smattering of Manx references securely linking this local love story to the Isle of Man. The chronicle is set to continue within a number of other books in the series, with a third and fourth already in the pipeline. Priced at £9.99, more about where to buy Crescendo and Maria Darnoult’s other publications can be found at www.mariadarnoult.com.